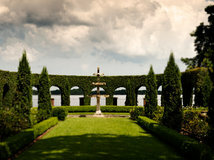 For most of us in the Northern Hemisphere, summer is at its peak. 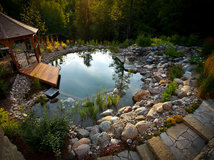 Days are long and hot, and nights are warm, relaxing and oh-so-romantic. 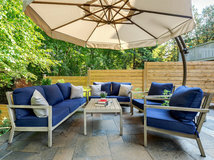 It's the prime time to stay outside as long as you can — and a good reason to make your outdoor space warm, bright and lively. 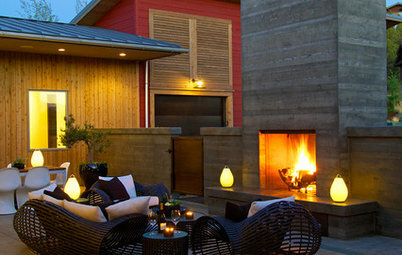 Innovations in outdoor lighting appear all the time, particularly when it comes to eco-friendly styles. 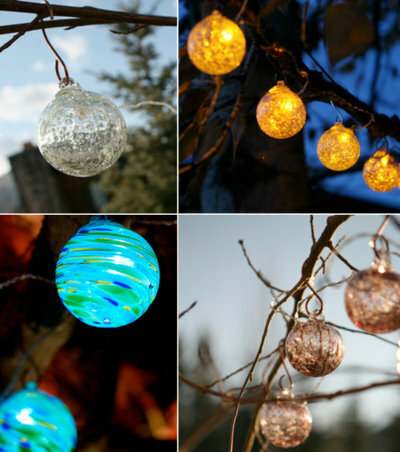 Many of these options come in the same plain-Jane white frosted or glossy finish, but you can add extra cheer to your patio this year with bright and creative outdoor lights like these. Summer weather is reason enough to celebrate. Unlit, this indoor/outdoor lamp looks at first like a white artichoke. But turn it on, and it explodes with color, looking more like a colorful rose. 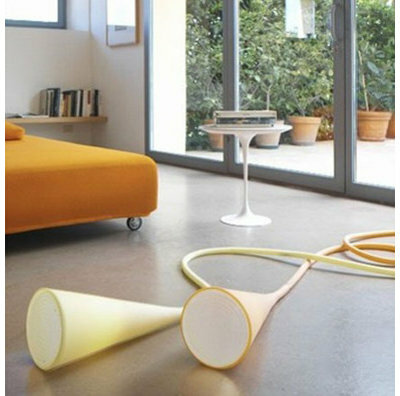 Although it's named after neither plant, the Clover is a beautiful work of art that can be used in any environment. 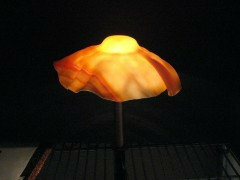 Hang from above, or use additional hardware to turn it into a floor or table lamp. Try a different kind of look for your next garden party by switching on these colorful planters once the sun sets. 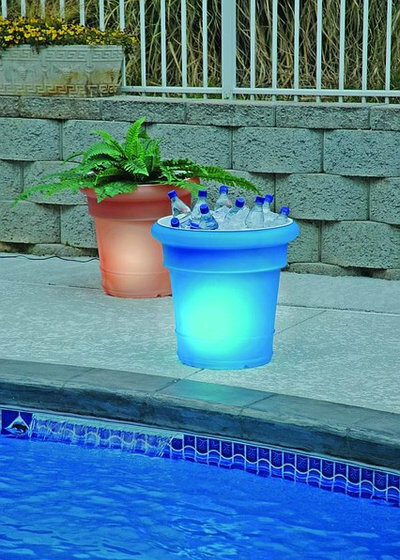 Completely solar powered, these resin planters come in several bright colors. A separate solar control unit can be positioned in direct sunlight to charge and power the planter. Buy several, and plug them into each other for a row of glowing pots. 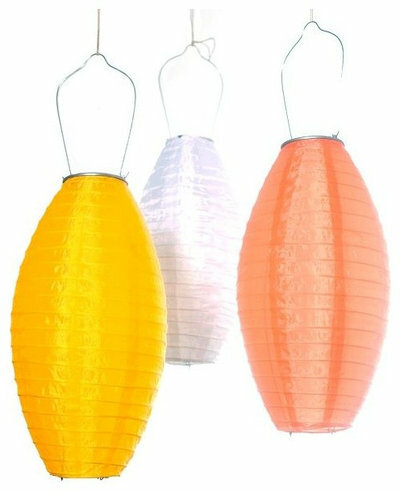 String these colorful nylon outdoor lanterns from a tree for an instant backyard party area. These brightly colored lights add an instant festivity to a space, and there's no fuss when it comes to lighting them up. 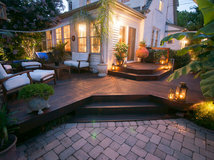 A solar LED light is nestled in each lantern, and they begin glowing as soon as it starts getting dark. 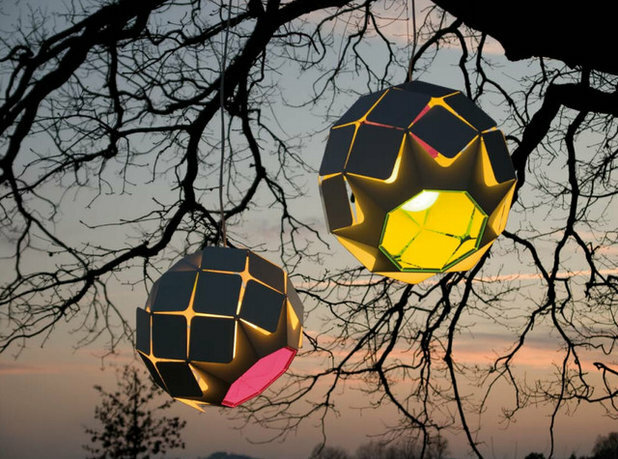 The lanterns can glow several hours without need of an extension cord or outlet. I love the delicate look of these dainty tealight holders from A+R Store. The two glass halves can be used separately, but when put together, they have a beautiful glow. Use two separate colors! When you look down on them, the two colors will blend together in a warm hue. These graceful glass orbs are a beautiful and elegant alternative to the standard stringed lights. 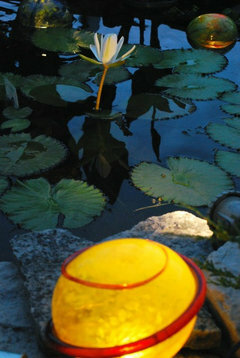 Hand blown by glass artisans, each little sphere holds a solar powered light that turns on automatically. 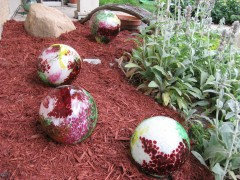 Whether you opt for the soft, neutral tones or the brighter and more cheerful colors, these mini globes of light look like they just belong in a sweet garden setting. 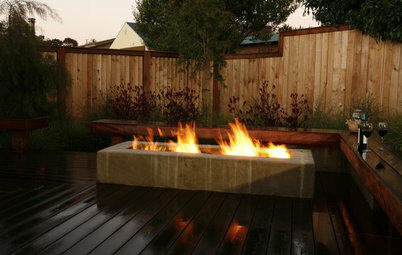 A patio heater can be a welcome addition to your outdoor area even if you live in a warm part of the country. 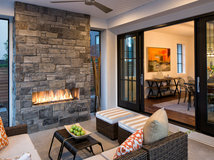 The Bella Petite from Kindle Living is a modern take on standard patio heater design. 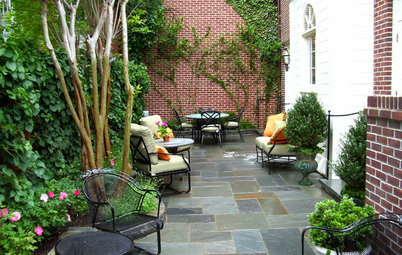 Instead of the heat disappearing as it rises from the heater, the shade keeps it within a comfortable range. 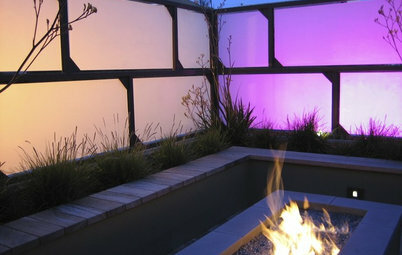 To top it off, it doubles as a colorful outdoor light. 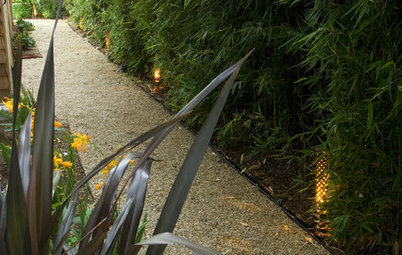 Choose from seven LED light colors, or a version that cycles through them all. The light can be used even when the heater itself is off. These outdoor lights look like seedpods or cocoons just starting to peel open. Regardless of what you see when you look at these, the Pod Lens is definitely a light fixture inspired by nature. 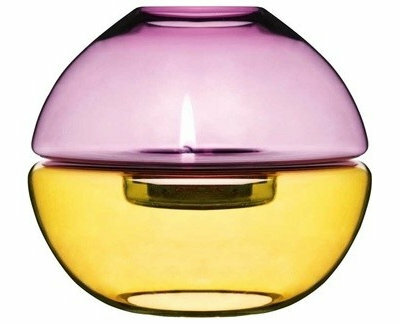 The diffuser is made of polycarbonate with waterproof and fade-resistant walls. 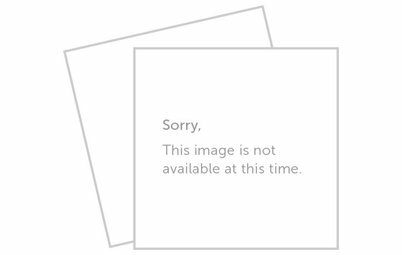 Use it as a floor lamp, pendant, install it on a wall, or put it on a ground stake. 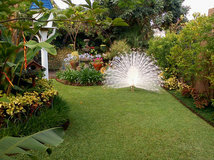 Place them all over your yard to create a glowing garden. Available in small and large sizes, the TULIP lamp is a whimsical garden accessory that adds a bright and playful touch to any outdoor space. Line up a row of the large versions to create an eye-catching display, or place a few of the small ones along the edges of a walkway. 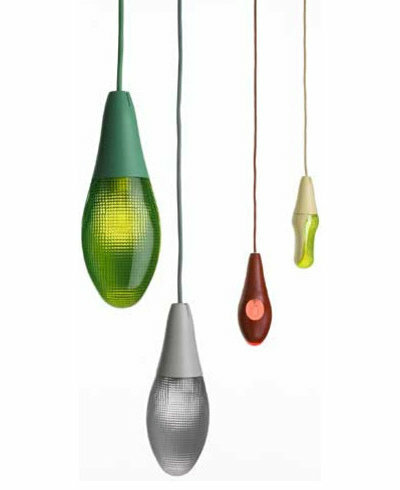 Designed for both indoor and outdoor use, the TULIP is available in a variety of colors. You've heard of sun jars, right? Well, this is a moon jar! Like a sun jar, moon jars are essentially a jar-filled solar cell, with a rechargeable battery and a low-energy LED. 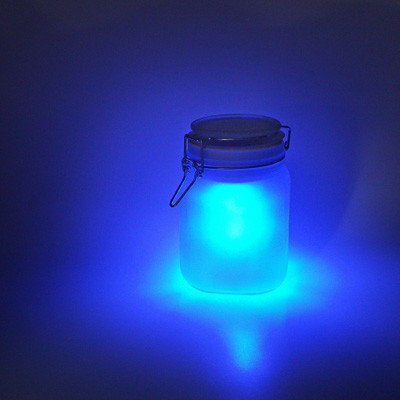 Place a moon jar into direct sunlight for a few hours, and the battery will be fully charged. 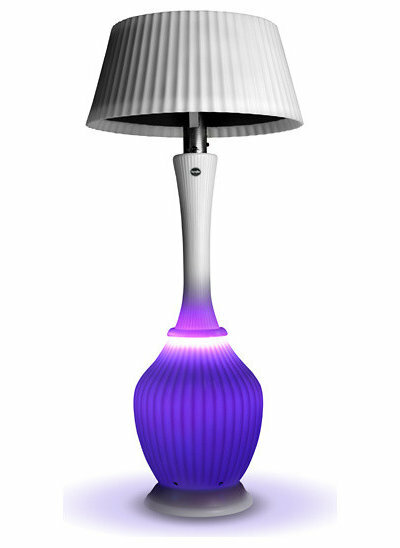 At night, it will automatically turn on to give your home a soft moon-like glow. These lamps are so flexible and friendly looking, they almost seem like a character from The Brave Little Toaster. Made out of pliable and smooth silicon rubber (the only truly fixed part of its design is the plastic screen which covers the bulb), it can be used outdoors as well as in. 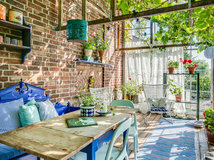 Its long cord and durability means you can hang it from a hook on the wall, lay it on the floor, toss it over a ceiling rafter, or lay it on a small patio table. This is a fantastic post! We live on a lake and spend a lot of time outside. Lighting is ALWAYS a problem. These are truly unique and fun ideas. Thanks ! 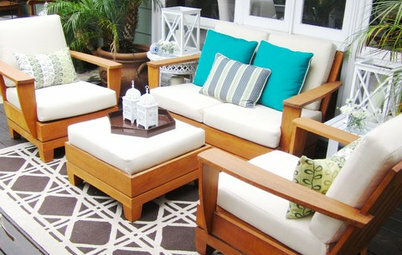 I think this ideabook gives me so many options and ideas and reasonable prices.